Siam Garden Cafe's Floating Market Noodles (Gwayteow Reua) are similar to Chinese oxtail soup, but may be ordered with beef or pork. 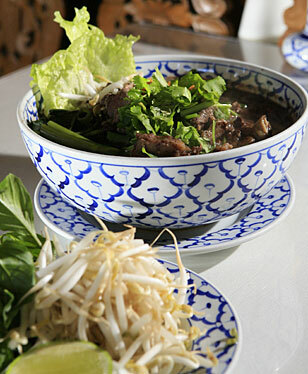 The dish is served with thin rice noodles, ong choi, bean sprouts and lettuce. Thailand. Exotic and a bit naughty. And its cuisine reflects that. "Thai cooking uses many herbs and spices," explained Vincent Hu, co-owner of Chiang-Mai restaurant, "and it features meat sparingly. Because it has a lot of herbs and vegetables, it's more healthy for you. We do have deep-fried items, but there's just less meat in them." And what about Thai cooking's reputation for being hot and spicy? ("Evil" and "volcano" on the menu mean just that). "I suppose that's to make you sweat more in hot weather, to cool you down," speculated Hu. But there are geographical reasons, too. "Northern Thai cooking, being close to China, is not very hot," said Supreecha Sangthong, co-owner of Pae Thai restaurant. "Central Thai style is medium-hot, and Southern Thai cooking, being close to India, is very hot." And there's a proper way to cook Thai food, according to Sangthong. 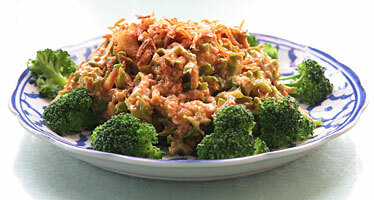 "First, you should cook your chili paste separately, then add your meat and then your vegetables. In American cooking, it's all done at the same time, so there's less distinction in flavor." Sangthong says that Thai herbs and spices have medicinal effects as well. "Chili helps your blood circulation and basil helps your digestion," said Sangthong. "Lemon grass is known to fight the flu." But it's the freshness that sets Thai cooking apart from processed and prepared American fare, according to Siam Garden Cafe co-owner Ed Gum. "I have to go down to Chinatown seven days a week to pick up all the ingredients we need to cook," said Gum. "We need a lot of spices and aromatic herbs because we serve a wide variety of dishes here. "Thai food is also usually served family-style, where everyone takes a little of each dish," Gum pointed out. "The meal is not always self-contained." So don't just stick with Pad Thai -- be a little adventurous and try some of these other great dishes. It is Thailand, after all. Wing Bean Salad is a specialty of Pae Thai restaurant.